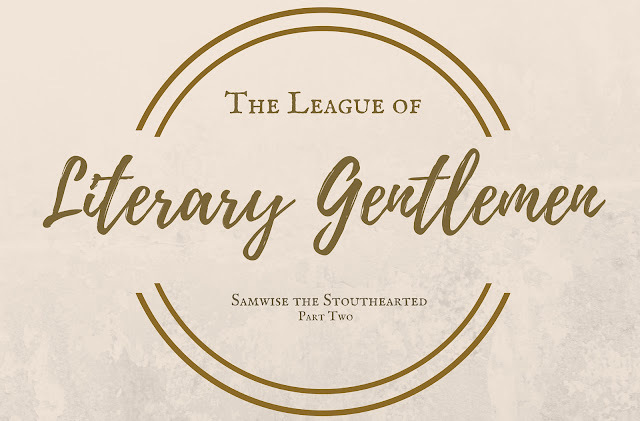 In part one of my adventure with Samwise Gamgee, I explored how his steadfast loyalties and his fearless bravery worked together to make him a heroic character and worthy of admiration. In part two, I will continue this exploration by discussing some of his softer qualities--the traits that make him persevere through the thick and thin, and the aspects that make him the gentle hobbit many people have come to love. Samwise isn't all ferocity and fearlessness; there is a softer side to him as well, a down-to-earth side (pun definitely intended). This side comes from being a gardener and loving things that grow. Often, Samwise thinks of plants and animals before anything else. He ended up in the whole mess because he was determined to cut the weeds under the windowsill at Bag End and overhears Frodo and Gandalf discussing the Ring and Sauron: "'Nothing! Least ways I was just trimming the grass-border under the window, if you follow me'" (FOTR 69-70). He also cares for animals tenderly, such as with Bill the Pony. He not only rescues Bill from the obnoxious Bill Ferny's harsh hand, but when he must part with Bill, he is torn: "Bill, seeming to understand well what was going on, nuzzled up to him, putting his nose to Sam's ears. Sam burst into tears, and fumbled with the straps, unloading all the pony's packs and throwing them on the ground" (FOTR 341). When he returns from his travels, Sam makes it priority to visit Bill first thing (ROTK 297). Sam's connection to the earth and to animals gives him a simple, humble demeanor. He may show bravery in the most dire of situations, but often, he is thinking of his garden and the Shire. Later, Sam uses nature to spread hope and joy in the Shire. He doesn't keep Galadriel's gift for himself; he shares it with the Shire to restore what was destroyed (ROTK 330). Sam's love for nature keeps him grounded during his journey through darkness and temptation. His humble origins in the Shire paired with his deep sense of connection to the earth are what balance out his ferocious bravery and overeager loyalty. He can sit back and enjoy the peace and quiet of good-tilled earth, knowing he needs nothing more than friendship, greenery, and maybe a pipe or draught of ale. The first mention of Samwise in the story discusses his love for stories, especially Mr. Bilbo's stories: "'He's in and out of Bag End. Crazy about stories of the old days, he is, and he listens to all Mr. Bilbo's tales'" (FOTR 24). Over and over, Sam mentions stories he's heard of Elves, 'walking trees,' and, of course, oliphaunts (FOTR 49, 283). In addition to gardening getting him into trouble, he also "eavesdropped" because he couldn't help himself: he is fascinated by stories. When he learns he will see Elves, he promptly bursts into tears (FOTR 71). He takes in the world with wide eyes, even finding himself disappointed when he learns not everything is as he imagined: "He had imagined himself meeting giants taller than trees, and other creatures even more terrifying, some time or another in the course of his journey" (FOTR 172). He also sings songs he's learned, or made up his own (FOTR 235). Basically, Sam is wonderstruck by the world around him. He hopes that all the stories are true and that the world is as incredible as he's heard. He's spent his whole life in the Shire, so he hasn't seen the world. He often has no sense of direction while they travel across Middle-earth (FOTR 80). Thus he is often amazed at the world. When they visit Lothlorien, he feels as if he's "inside a song" (FOTR 393). When they are traveling, he often forgets about the quest to marvel over plants or whether or not there are oliphaunts around: "Sam drew a deep breath. 'An oliphaunt it was!' he said. 'So there are oliphaunts, and I have seen one. What a life! But no one at home will ever believe me'" (TT 302). It's this sense of wonder and fascination to the world that keeps him grounded along with this love for nature. His wonder keeps his thoughts held high as he traverses the darkest parts of the world. He takes time to think about others--such as the soldiers fighting for the other side--and to daydream about the stories that might be told about his journey someday (TT 301; ROTK 245). When he focuses on what is to come, instead of the present moment, he is able to persevere through the hardships. It's the heart of fantasy and stories in general: to bring hope to a desperate situation. Just as Sam's loyalty flows into his bravery, his fascination with the world and with stories flows into his sense of hope. Throughout the novel, Sam claims he has given up hope, yet I find that to be the opposite. More often than any other character, Sam is the one with the optimistic outlook. When they are being hunted by Wargs, Sam is scared, but he also has a sense of hope that they'll make it through: "'But we aren't etten yet, and there are some stout folk here with us. Whatever may be in store for old Gandalf, I'll wager it isn't a wolf's belly'" (FOTR 334). When Sam and Frodo depart from the Fellowship, Frodo doubts he will ever see their friends again, but Samwise reassures him that they might still (FOTR 457). Even in the midst of despair, Sam is cheerful and hopeful that things will turn out for the better and they will make it through. After Frodo is taken by the orcs to Cirith Ungol, Samwise still doesn't give up hope. His love for Frodo spurs him onward to rescue him: "Faint as was the hope that his guess brought him, it was enough to rouse him. There might be just a chance. His love for Frodo rose above all other thoughts, and forgetting his peril he cried aloud: 'I'm coming, Mr. Frodo!'" (ROTK 183). In the midst of the Cirith Ungol, surrounded by the corpses of the dead orcs, he even manages to find the will to sing, despite his grief (ROTK 194). When Sam realizes he might not return to the Shire, his hopeful attitude starts to fade out of sorrow, but it soon rises in a new strength: "Sam's plain hobbit-face grew stern, almost grim, as the will hardened in him [...] with a new sense of responsibility, he brought his eyes back to the ground near at hand, studying the next move" (ROTK 225). Despite overwhelming odds and obstacles that falter their journey, Sam continues to rise above the gloom until the very end. Atop Mount Doom, the two little hobbits watch Sauron's reign fall. They accomplished their quest, and Frodo has given his last bit of strength. And yet, Samwise continues to be optimistic, believing the end has not come for them just yet: "'But after coming all that way I don't want to give up yet. It's not like me, somehow, if you understand'" (ROTK 244). Thus, their journey continues as they return to the Shire and rescue their people. Again, they are facing an insurmountable obstacle, but as they are arrested, Sam and the other hobbits laugh and sing their way to the prison house! (ROTK 306). Samwise's greatest strength--more than his bravery, loyalty, fascination with the world, and simplicity--is his ability to find hope in the midst of darkness and despair. This, more than anything, allowed him to persevere through Mordor by Frodo's side. It was only with a small ounce of hope, a small bit of light among the blackness, that allowed the story to end with freedom and victory. Samwise Gamgee has a lot of endearing qualities that make him a memorable character. He is known for his steadfast loyalty and inspiring feats of courage. He grows from being a simple hobbit with a love for stories to a strong hobbit with a sense of purpose, gratefulness for the world, and hope for a future. He is the reason Frodo succeeded in his mission; without Sam, Frodo wouldn't have gotten far at all. But Samwise is still a hobbit, a small fellow in a wide world, and he holds on to that throughout the story. It is this, more than anything, that makes Samwise truly memorable. It would take a lot to journey through such overwhelming circumstances, but he keeps up because he must. He knows that is what the folk in the great stories do--they keep fighting because it's all worth it. All quotations from from 2012 Del Rey Mass Market editions of The Lord of the Rings by J.R.R. Tolkien: The Fellowship of the Ring (1954), The Two Towers (1954), The Return of the King (1955).